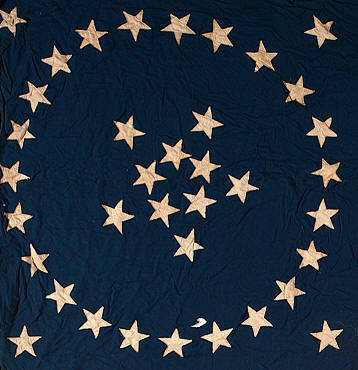 The two most spectacular and sought after patterns of American flags from the 19th century are the Great Star pattern, also known as the Grand Luminary pattern, where the stars themselves form a larger star; and the medallion pattern, which consists of one or more concentric wreaths of stars, and typically has one or more outlier stars in each of the four corners of the canton. Both are very rare, and are highly prized because of their distinctive, memorable patterns. This beautiful flag of 37 stars is a hybrid of both great patterns, having a great star of 10 stars at its center, surrounded by a single-wreath medallion with 23 stars in the wreath and one star in each corner. Only a handful of "great star in a medallion" flags are known, and this is one of the most striking of any I'm aware of. 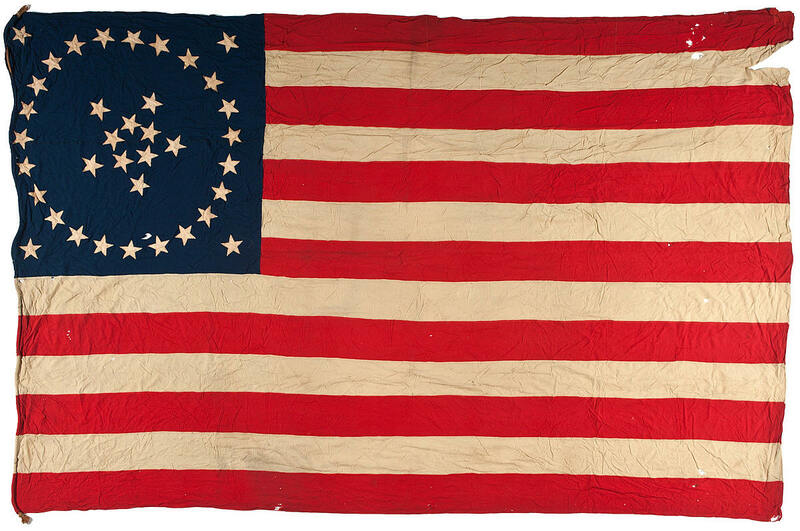 Pieced and sewn flags of 37 stars are themselves very scarce, which also adds to the desirability of this flag. It seems that between the end of the Civil War in 1865 which ended on the 36 star flag, and the American Centennial in 1876 where large numbers of 38 star flags commemorating Colorado were made, patriotic fervor seemed to wane, and with it, the manufacture of flags. Whatever the reason, I've only seen a very few examples of pieced and sewn 37 star flags appear in the marketplace, and of those, probably fewer than five with patterns other than rows. It remains a spectacular survivor from the post-Civil War Reconstruction Era. Learn more about the Medallion pattern.